Honeywell vs. General Electric: Which Looks Stronger After Reporting Earnings? Honeywell's stock jumped after its recent earnings report, while GE's sank. Are these trends going to continue? It's been a rough year so far for stocks, and it's been no different for industrial conglomerates Honeywell (NYSE: HON) and General Electric (NYSE: GE). Both stocks were having an abysmal January, along with the broader market. Maybe the market is right to be optimistic about Honeywell's prospects and cooler about GE's. But it's important to look at the larger picture. Back in mid-December, both companies presented positive 2016 outlooks to their shareholders. GE forecast core organic growth of 2%-4% and Honeywell said it was looking at 1%-2%. Since then, both stocks have lost ground, although both have outperformed the broader market -- GE by a little and Honeywell by a lot. It's important to remember that the just-released earnings reports weren't looking at 2016, they were looking backwards to the last quarter of 2015. We could assume that the market should have known would be volatile, due to the falling price of oil, but that didn't seem to be the case. Both companies are dependent on oil and gas markets for a portion of their sales: GE derives 15.1% of its sales from its Oil and Gas division, down from 17.4% in 2014. Honeywell reported that 11% of its sales come from the industry, down from 16% in 2014. Both companies predicated their upbeat December outlooks on a recovery in oil and gas prices that so far hasn't materialized. Those oil and gas prices were the main reason GE reported both lower earnings and profits from its industrial divisions for the quarter. Industrial revenue was down 1% and profits declined 8% YOY. Total earnings declines were much larger, but were unsurprising due to GE's continuing divestitures of its former GE Capital (i.e. non-industrial) businesses. The results revealed just how much of an impact low oil and gas prices have on GE. Quarterly Oil and Gas revenues dropped 16% YOY. 5% growth in the Aviation division (which has been one of GE's star performers lately) and 20% growth in Energy Management weren't enough to offset the Oil and Gas miss. None of this, though, differs significantly from expectations. And a major part of the thesis for GE right now is the cash it plans to return to shareholders from the divestiture of its GE Capital assets, its recent sale of its Appliances unit, and share buybacks and dividends. Once all of that is complete, though, GE will be a very different company and industrial performance will be front and center. For now, though, CEO Jeff Immelt said GE is "committed to our 2016 framework in the face of macroeconomic volatility." Honeywell, on the other hand, had a solid quarter that capped off a solid year. It was the company's sixth consecutive year of double-digit EPS growth. Really, the only weakness seemed to be in the Performance Materials & Technologies segment, due again to low oil and gas prices. The company did record strong oil and gas orders during the quarter, but still expects 2016 PMT sales to decline 11%-13%, offset by strength in other divisions. Even in challenging economic environments, Farr and his team have consistently been able to set realistic goals and achieve them. The last quarter and year were no exception, and even with the market weakness this January, they are unfazed, reiterating their prediction of 6%-10% earnings growth for 2016. The only thing to watch out for is that their prediction is based on a recovery in oil prices. If such a recovery fails to materialize, we may be looking at growth on the lower end of that spectrum. But otherwise, the company appears to be in great shape. Despite their similar industrial components, there's really no comparison between GE and Honeywell right now. GE is a company in the midst of a massive transition. Honeywell is staying the course. 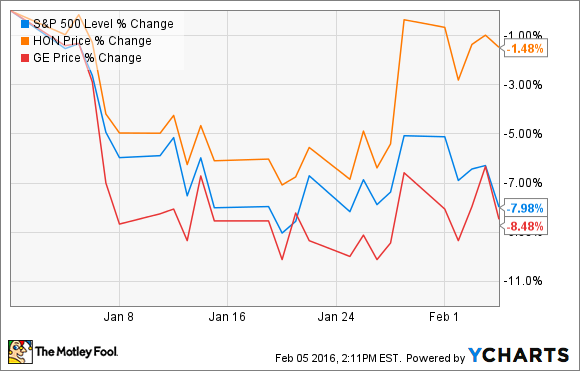 Unsurprisingly, it's Honeywell that seems to be positioned for a better 2016. Not that it's a bad idea for GE to be making this shift. Honeywell has been very successful focusing on its core industrial businesses. Once GE completes its transition, it will hopefully resemble Honeywell ... and that's a good thing. GE also seems to be effectively executing its transformative plans. But given the choice between a solid stalwart staying the course and a shaky stalwart heading off into uncharted territory, you should probably take the former.